There was plenty of support when Sydney North celebrated the official launch of the Sydney North HealthPathways website with over 200 health professionals in attendance on 30 May 2017 at the Epping Club. 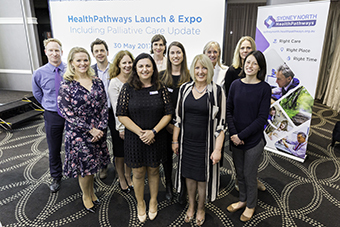 The launch event included a live demonstration of the HealthPathways with a focus of the event aligned to Palliative Care Week. Sydney North HealthPathways is a collaborative partnership between Northern Sydney Local Health District and Sydney North Health Network. Work stream areas currently in development include Aboriginal Health, Aged Care, Dementia/Cognitive Impairment, Hospital in the Home, Musculoskeletal, Sexual Health, Pregnancy, Respiratory, Diabetes, Mental Health, Palliative Care, Child Youth & Family/Paediatrics. “HealthPathways is a wonderful platform that will improve coordination of care for patients, and facilitate better communication between GPs, other primary care clinicians, hospital doctors and services across the district. This will translate into appropriate and timely use of resources, a better patient experience, and ultimately better health outcomes. The launch on May 30 highlighted the diversity of health providers throughout the Primary Health Network and the Local Health District and reinforced the passion and commitment we all share in providing excellent patient centred care,” said Dr Fiona Robinson, HealthPathways GP Clinical Lead.